A few days ago, we went to the bowling lanes of SM North Edsa Annex to witness something special. A couple of our differently abled friends and their partners have gone hand in hand with SM Cares in the goal to actually be real deal bowlers for a day and we witnessed that first hand. SM Cares wants you to know that they actually have their facilities available for your family no matter who you are, what you do and how you are in the society. SM takes pride in an environment fit for your family and they've been able to do this for years. We met a couple of their executives and one got me surprised. One of my bowling idols was there, do you remember World Champion CJ Suarez? Cj Suarez is now the Division Manager for SM Bowling and Leisure Center. He's been with them a couple of months ago. I've seen him play for the country several times along with legends like Bong Coo and Paeng Nepumoceno. He used to handle sports programs for special children too in the past, mostly with ILLC in Mandaluyong. People might thing SM is just providing these facilities for ordinary people, but as you see they're actually playing games and enjoying it. The activities that we do, we give out and share with people with special needs. It's their advocacy. SM Cares approached them and asked for this Bowling Buddies event and they never hesitated to accommodate them. There are several other organizations and special olympics participants that use the lanes too. They do this on a regular basis. That's endearing to know. They have activities with PWD's and they'll be doing this on a regular basis next year too. They have the venue, 8 bowling centers nationwide. CJ Suarez left bowling since 2007 and he's devoted much of his life playing for the country. When SM approached him he never hesitated, he explored and accepted this as an opportunity. He can now promote the sport at an advantageous angle. There has been a decline in the sport but he's hopeful their efforts will pay out especially next year. They're also hosting their biggest event in November with a prize as much as 2 Million pesos and a brand new car called SM Millionaires Cup. It's across all their centers and the top 32 from all their centers nationwide will battle it out in Manila as part of their celebration since SM Bowling is now 25 years old. They're going to have an international tournament also next year that would be even bigger because they're inviting professional players from around Asia and the world to get a more rearing interest in the sport, more so in the talented pool in the Philippines. There are going to be some school programs as well next year plus coaching certifications for those who would want to pursue it. You should watch out for that big tournament soon. Bring your family because that's where you can bond big time. SM is a mall for all. They want inclusion for everyone to enjoy their facilities. No one gets left out. For differently abled customers, you can play here. You should be aware that they have programs here that would be able to cater to you. 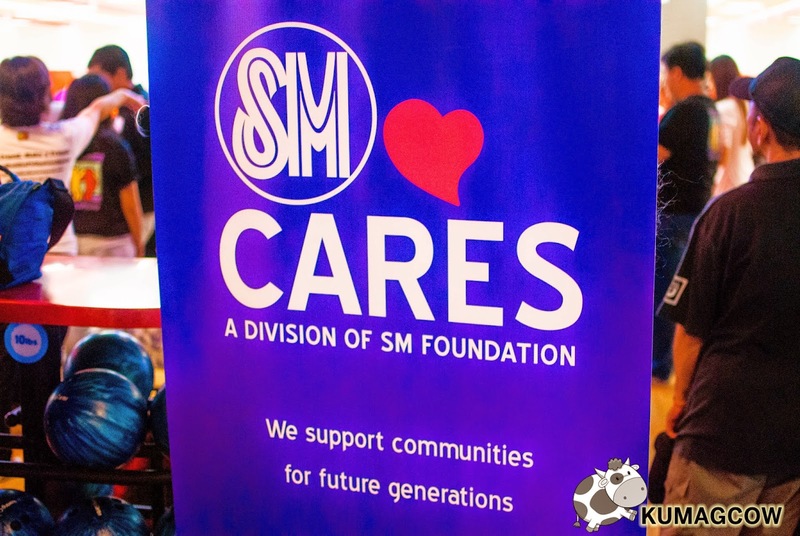 They have other organizations also aligned with SM CARES' cause. The Angels Walk will also be happening soon in Mall of Asia so make sure you check out their social media channels to participate in that. SM Cares will also push for activities like these to be a regular thing so awareness can be done. The organizations usually tap them and they won't say no if they see there's potential to reach out to big communities. Don't think you won't enjoy activities like these because as I see it, they've succeeded to make these guys and gals happy. The name is apt for them, SM Cares.